The Leafs blueliner chokes back tears when responding to fans. Ask any Toronto Maple Leafs fan for their opinion on defenseman Jake Gardiner and you’re likely to get an earful. Love him one minute, hate him the next minute… that’s been the story of Jake Gardiner over the course of his eight seasons with the team. Want an example? Look no further than last night’s game against the Colorado Avalanche. Early in the second period Gardiner looked awful in a puck battle with Avs forward Carl Soderberg, allowing Soderberg to walk right around Leafs goaltender Frederik Andersen before easily tucking it home. Gardiner… well let’s just say he didn’t look so great on this play. Yikes… that’s ugly. Even uglier? 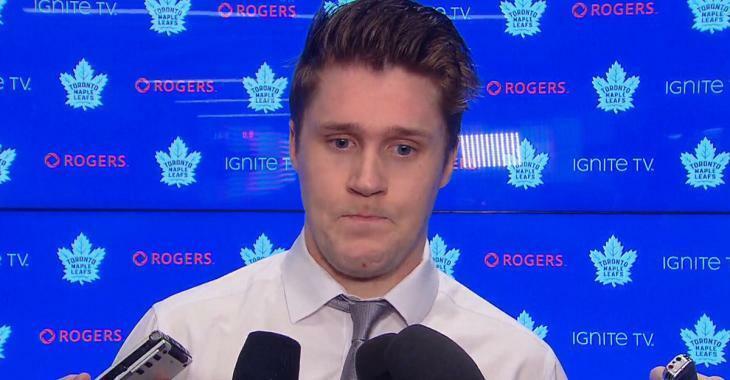 The reaction that Gardiner received his next shift. After the game, Gardiner’s teammates came to his defence and actually called out the Leafs fans who were booing the 28 year old defenseman.